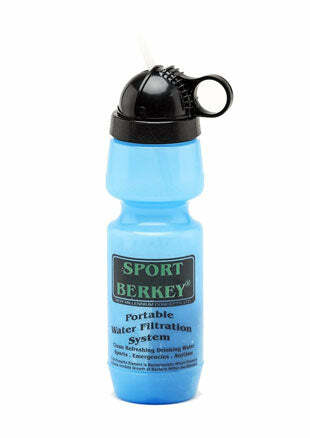 Berkey Water Filters are The Most Powerful Gravity Filters Available. 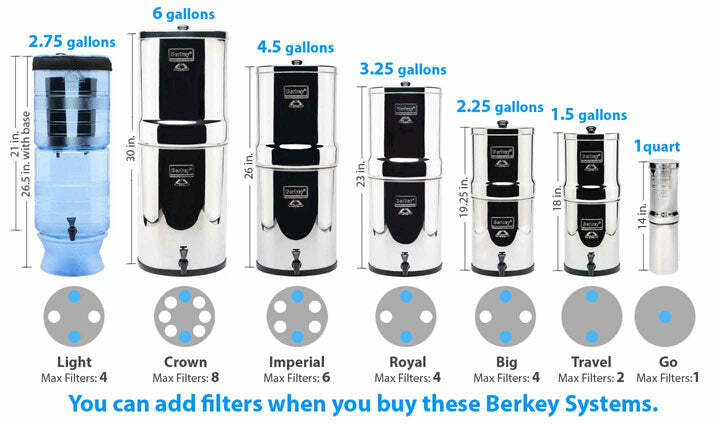 The Berkey filtration systems come in 7 different sizes – or models. The systems are identical apart from their storage capacity and maximum filtration rate. They all use the same filters. The 1.5-gallon water tank is ideal for one or two people, or a camping trip. The Travel Berkey is 18″ high, although it can be collapsed to 12″ for storage. It has a 7.5″ diameter. It can hold a maximum of two filters which will filter up to 2.5 gallons of water per hour. Compact - Stands 18” high when in use. 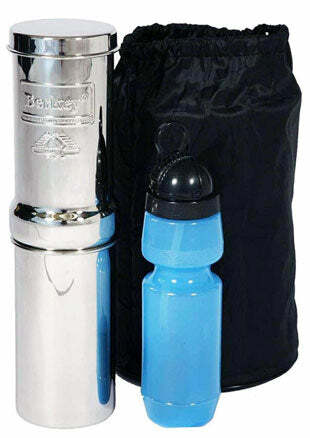 Top your Travel Berkey off at the end of the day and in the morning you have safe fresh-tasting water. The 2.25-gallon water tank is a good size for most average families. In fact, Berkey mentions that this is the most popular size they sell. The Big Berkey is 19″ tall and has a diameter of 8.5″. It can hold a maximum of four filters. The filtration time per hour varies depending on how many filters you choose to install. With a 3.25-gallon water tank, the Royal Berkey is a good fit for larger families or small businesses. This system is 23″ tall and has a 9.5″ diameter. It can hold a maximum of four filters and filtration time depends on how many filters you choose to use. Featuring a hefty 4.5-gallon water tank, the Imperial Berkey is twice the size of the Travel Berkey. That makes it a good fit for large families who drink a lot of water or small offices. The Imperial Berkey is 25.75″ tall and has a 10″ diameter. It can hold a maximum of 6 filters and filtration time per hour depends on how many filters you choose to install. With a massive 6-gallon water tank, the Crown Berkey is certainly the king of the Berkey family of water filters. Crown Berkey is 30″ tall and 11″ in diameter. It weighs 12.6 pounds and can filter 6.5 gallons per hour. The Berkey Light is a see-through, more portable and lightweight alternative to the stainless steel models with the same filtration abilities. The Berkey Light weighs only six pounds, yet it can hold up to 2.75 gallons of filtered water. Great for home use, travel, outdoor activities, and during unexpected emergencies. The Go Berkey Kit is designed for camping, backpacking, school, on your desk at work, travel, in times of emergency or other outdoor activities. It is lightweight and easily transportable. 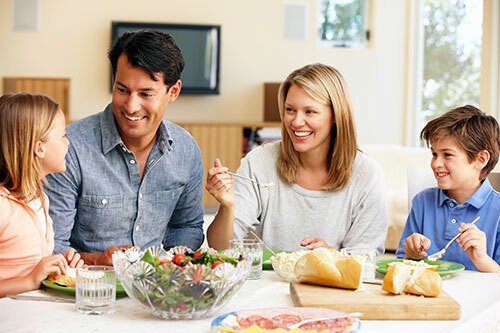 The Go Berkey system uses the same highly powerful Black Berkey filter as the big system that removes pathogenic bacteria, harmful chemicals and other contaminants. The Sport Berkey Portable Water Filter is the ideal personal protection traveling companion — featuring the IONIC ADSORPTION MICRO FILTRATION SYSTEM. The theory behind this innovation is simple. The bottle’s filter is designed to remove and/or dramatically reduce a vast array of health-threatening contaminants from questionable sources of water, including remote lakes and streams, stagnant ponds and water supplies in foreign countries where regulations may be sub-standard, at best. See the Laboratory Testing Results of our filters. The water that is flowing from the tap is not actually something that you would think as entirely clean. Before it reached the faucet in your home, it has already travelled through miles and miles of pipeline and it has picked lots of contaminants along the way. This is why you need to consider using a water filtration system to help you improve the water quality and for health purposes. We only need a small amount of the mineral fluoride. Excessive amount of it can be toxic especially to children below 8 years old. Fluoride is added to most toothpastes, soil fertilizers and even water systems that had caused an alarm worldwide. Anything in excess is not beneficial. This act makes users prone to over consumption of the mineral that can cause serious health damage. Irrefutable evidence shows that high fluoride consumption is directly associated to gastrointestinal problems, low fertility, thyroid and endocrine related ailments and even cancer. Another parasite that could cause the same symptoms that was mentioned above is called the Cryptosporidium, and what even made this parasite dangerous is because it is resistant to chlorine, so it really needs to be filtered out using a mechanical filter. A lot of pathogens could be omitted from your water by passing it through an ultra, a micro or a nano filter. Most other filtration systems are inadequate because they do not remove viruses or bacteria, and many remove the beneficial minerals that your body needs. Perhaps that’s why Berkey systems have long been recognized as the world’s ultimate in water purification.